I decide to go into the very distant past and go way, way back to 1992 where I sat as a child and decide to draw what was before me. Sitting at the table ready to draw, from my young perspective was the entire kitchen ready to be lovingly recreated on my little piece of paper . 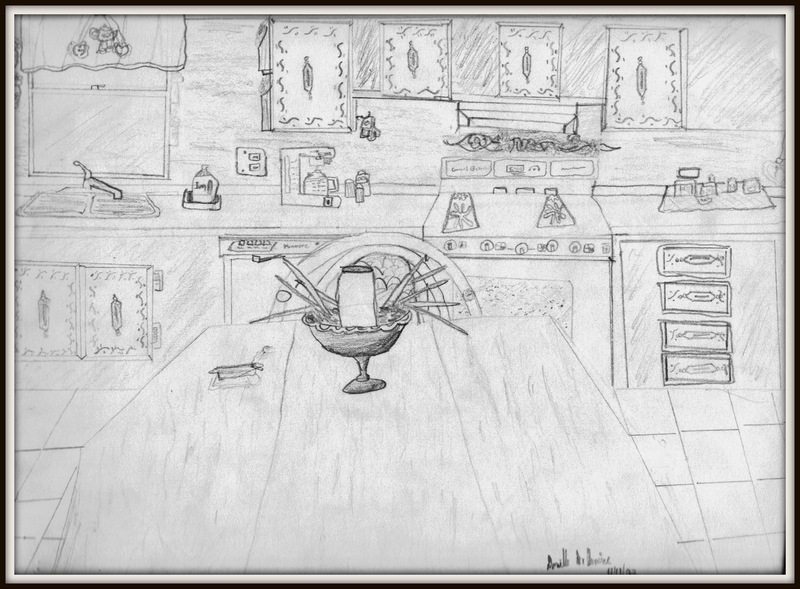 I remember there wasn’t a particular reason why I decided to draw the entire kitchen that day. I just wanted to draw- period. Remember when things were that simple? You just did what you wanted (with the approval from a parental unit, of coarse) and there were no getting side-tracked or caught up in worries. You just drew what ever you wanted without stress of adult responsibilities weighing you down. Looking back at this drawing, I remember taking my time to draw every detail, I wasn’t concerned about get the perspective just right, nor did I care that my lines weren’t all that straight. I recall proudly showing my mother what I drew and her giving me a encouraging smile and hug and telling me how wonderful it was. That’s really the heart of this memory. Not the drawing, or the time-frame in which it took. It was my mother always being there encouraging me to be what I wanted to be. In my heart of hearts I am an artist and always will be.